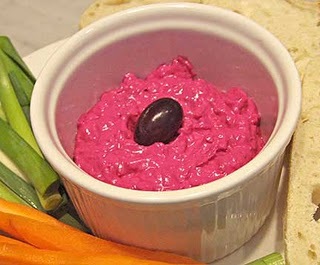 My version of Logia tis Ploris’ Beet and Yogurt Spread has a startling, deep color, and strong, refreshing flavors. The spread makes a festive addition to holiday buffets. The garlic in it wakes up taste buds jaded by too much rich food, and helps digesting Thanksgiving-sized portions of turkey and gravy. The intense color of this spread may initially be intimidating, but the flavor is delicious. 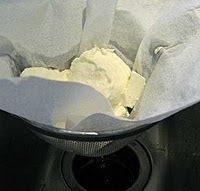 Puree garlic by mashing it into the salt with the flat of a knife on a cutting board or in a mortar and pestle. Mix strained yogurt, pureed garlic, salt, grated beets, olive oil, and red wine vinegar. Taste and adjust seasoning by adding garlic, salt, or vinegar, as needed. Serve with artisan-style bread, and raw vegetables such as carrots, leeks, or celery. NOTE on Roasting Beets: Preheat oven to 400°F. Wash beets, cut off greens leaving an inch of stem (don’t cut into beet itself), rub beets with olive oil, and wrap tightly in a foil packet (or place in tightly covered baking dish). Bake for 40 minutes to 1 1/2 hours, depending on size of beets and how fresh they are. Beets are done when they’re tender when poked with a knife or skewer. Let beets cool, and slip off their skins (I wear gloves when I do this to protect my hands from staining). Beets can be roasted ahead and kept in the refrigerator for about a week.